Morphy Auctions’ July, 2017 Fine and Decorative Arts Sale to Present Over 800 Lots of World Class Paintings, Sculptures, Glass, Lamps, Pottery, Jewelry, and Other Important Antiques. This highly anticipated event includes a significant collection of United States Presidential materials, including busts, seals, and statues. Denver, Pennsylvania, June 8, 2017 – Morphy Auctions, the finest auction destination for fresh to the market collections, is excited to announce this comprehensive sale to be held on July 22, 2017, beginning promptly at 9am. A full range of collectible items from the most recognized makers – including Tiffany, Loetz, Amphora, Rookwood, Quezal, and Galle – are represented. This event also features fine jewelry and watches at a full range of price points. All items from this sale are on display in Morphy’s Denver auction gallery and available for preview now. This sale offers a Presidential caliber selection of materials related to United States leadership and history. George Washington related artwork features prominently in this category. Lot #151, a framed portrait of our first President from 1793 by Edward Savage is estimated at $75,000-150,000. This most impressive work is framed in a large wooden and gold colored frame that is heavily and ornately carved. Lot #73, a bronze bust of President Washington in a jacket with a collared shirt and ruffled ascot, is estimated at $1,000-2,000. The bust sits on top of a white, grey, and pink marble base and is signed by the artist, Felix de Weldon. Lot #89, a bronze and stone bust of President Theodore Roosevelt, is another high-profile selection in this grouping. The President is wearing a shirt, coat, and tie, and is mounted on a partially polished stone base. This piece is illegibly signed in multiple areas but its “The Art Foundry” symbol is visible. This bust is estimated at $800-1,500. And lot #152, 28 Presidential Portrait Miniatures, is certain to generate huge interest amongst history fans. This lot include 28 hand painted Presidential portrait miniatures in a large frame, starting with Washington and concluding with Harding. Each is framed in a small golden oval frame and has a plaque indicating the President’s name, birth and death years, and inauguration year. All portraits are mounted on a light green velvet background and the entire collection is mounted within in a beautifully carved golden colored frame. This White House worthy rarity is estimated at $5,000-15,000. This sale also presents an outstanding collection of fine art, paintings, and posters. Worthy of a celebration is lot #142, a c. 1894 framed Henri De Toulouse Lautrec Confetti Poster. This absolutely joyful example was made for the English paper manufacturer J. & E. Bella, and promotes paper to replace plaster confetti, which was outlawed in 1892 because it was considered too dangerous. It displays wonderfully, has a great look with strong colors, and is estimated at $50,000-70,000. And it’s off to the races with lot #228, a painting of the racehorse Secretariat by artist Orren Mixer. This work is the only painting portraying Secretariat in this manner, comes with full provenance, and includes a Certificate of Registration from the American Quarter Horse Association. This previously undocumented Mixer painting is estimated at $50,000-80,000. Collectors seeking the finest selections of antique leaded and art glass examples need look no further than this sale. Lot #554, a circa 1910 original Tiffany Spider Lamp is truly electrifying! Its 15” shade is marked “Tiffany Studios New York 1424″ and its 18” mushroom bronze base is signed “Tiffany Studios New York 337”. The lamp includes its correct spider finial and is estimated at $25,000-35,000. Lot #471, a D 1202 Quezal silver overlay vase estimated at $2,500-3,500, is another sterling example from this category. This large signed example blooms with a silver overlay floral decoration and an iridescent finish with gold and magenta highlights. This event also offers a full spectrum of over 50 colorful Loetz brand vases, bowls, and compotes. Lot #427, a rare Loetz Phanomen Gre 6893 vase from circa 1898, is estimated at $2,500-3,000. It is made from mountain blue glass and is detailed with an overall pattern of undulating horizontal waves covered in fine iridescence. Lot #430, a signed Loetz Argus Gre 2/351 vase in spreading chestnut is estimated at $2,500-3,000. It is gorgeously decorated with silvery blue waves and discs and covered in a highly iridescent finish. Pottery rarities are another important category in this upcoming auction. Over 30 fine Rookwood lots are on offer, representing many styles, colors, and production eras. Lot #664, a 1921 Rookwood scenic vellum vase in shape number 932E, is estimated at $800-1,000. It is 8” tall and features a peaceful scene of tall green trees painted by artist Fred Rothenbusch. Roseville pottery also makes a strong appearance, with almost 70 fine bowls, vases, and decorative items available. Lot #690, a 28” Sunflower jardinière and pedestal is a gardener’s dream and is estimated at $1,200-1,500. Lot #716, a 14” Futura “Arches” vase in shape 411 spans past and future design and is estimated at $1,000-1,250. And lot #717, a 12” Futura “Table Leg” vase in shape 410 is the best of both worlds and is estimated at $700-900. This event offers enthusiasts a solid gold opportunity to add some remarkable baubles and bling to their crown jewel collection. With over 75 lots of fine watches, rings, necklaces, bracelets, and pins on offer, there is truly something for everyone. Lot #583, an 18K articulated snake bracelet is estimated at $4,000-6,000. It comes to life (in a good way) with fabulous and intricate red and green enamel work. Lot #589, a beautifully detailed 18K elephant pin with ruby eyes, is estimated at $3,500-5,500. Its pointing upward trunk design insures good luck for its wearer. And it is always the right time for lot #629, a Rolex Oyster Perpetual Two Tone Datejust watch, estimated at $3,000-6,000. This lovely timepiece features a white mother of pearl dial and diamonds and sapphire detailing on the face and dial. This comprehensive sale comes full circle with amazing selections of general antiques, firefighting collectibles, display cabinets, photographs, napkin rings, and other desirable functional and decorative items. Lot #307, a circa 1840-50 pressed felt stove pipe hat from South Penn Hose Co. is a real head turner and is estimated at $4,000-5,000. And ending on a high note, make sure to check out lot #372, an 1885 Charles Paillard and Co. Swiss orchestral music box from the of Rita Ford collection. This world class example marries its musical box feature with automata; three Mandarin characters ring bells and turn their heads from side to side in tune to the music as the box is being played. It is estimated at $10,000-15,000. Morphy Auctions is located at 2000 North Reading Road, Denver, PA 17517. We can be reached by phone at 717-335-3435, by fax at 717-336-7115, and by email at info@morphyauctions.com. Morphy Auctions is open seven days a week from 9am to 4pm. 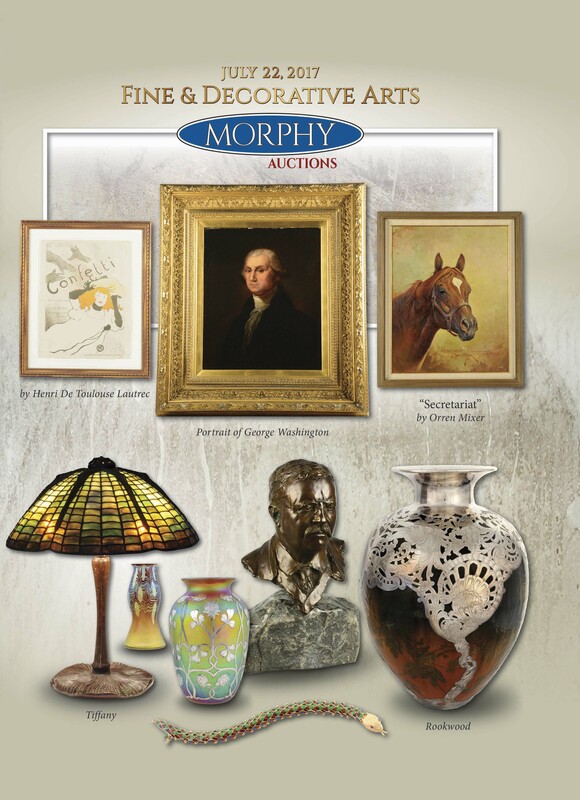 For more information on Morphy’s, please visit www.MorphyAuctions.com.